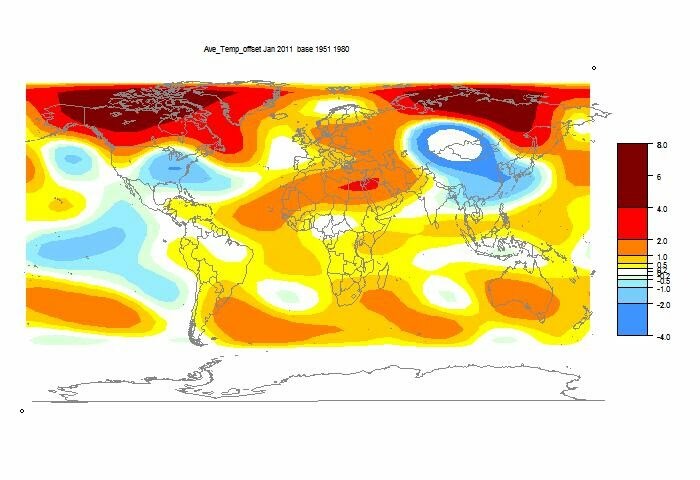 The TempLS analysis, based on GHCNV3 land temperatures and the ERSST sea temps, showed a monthly average of 0.219°C, down from 0.35 °C in December. This echoes a greater drop in the satellite averages. There are more details at the latest temperature data page. Below is the graph (lat/lon) of temperature distribution for January (It's Jan 2012, despite the title). Update - despite my confidence here, it is actually Jan 2011 - a sort of Y2012 error (I had the year hard-coded). The correct plot, with GISS comparison, is here. This is done with the GISS colors and temperature intervals, and as usual I'll post a comparison when GISS comes out. There was a cold region mid-Asia whic h goes outside the standard color range. A new layout. The data now sits in selection boxes, so I can include mich more of it. It does mean two clicks instead of one. A new multiple regression capability, which I think is quite powerful. You can use any of a number of calculated functions, or any data vectors as regressors. For example you could regress temperatures against various forcings. To complement this, a calculation capability - you can create and plot linear combinations (eg differences) of data vectors. An image can be used as background. This is useful for superimposing plots on published graphs (as in the Hansen predictions post). A user input capability. You can input your own images, or your own data. New windows for the markers for the plotted curves and their axes. This removes the limitation on how many you can have. One thing that doesn't currently work is the ability to provide a web address that would regenerate the current state. This is because of the greater number of state variables. But I'm working on it. Update: it works. See new post. The new data consists mainly of more complete collections of things like the regional data of GISS and UAH, and more NCEP data. And HADCRUT 4 is included. But there's room for more - suggestions welcome. Here's the plotter - details below. There is a disagreement over the Phillipines, where I get a cold spot and GISS doesn't. Otherwise they match well. These are being discussed again. WUWT has rediscovered the NOAA analysis of USHCN adjustments to ConUS (lower 48 states) temperatures. They have inflated the original Fahrenheit adjustment trends restated in Celsius to make their argument. It's accpmpanied by a recent analysis by Roy Spencer of ISH data, which he has assembled into an index for ConUS, and finds that the trend 1973-present is small. But his figure includes his own adjustment for population density, and comes out to 0.013°C/decade. 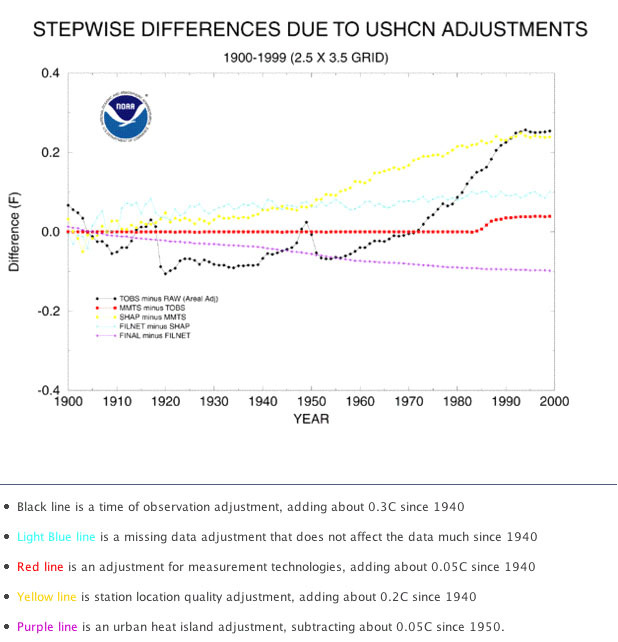 This he compares to USHCN at 0.245°C/decade, and attributes the difference to USHCN adjustment. CRUtem 3, which doesn't make the same adjustments, gets a trend of 0.198°C/decade. It's unfortunate that Roy doesn't seem to give any trends from ISH that aren't subject to his population density adjustment, because then we could compare like with like. However, I will look at the GHCN unadjusted data for ConUS. This is a real test of whether the WUWT (and RS) claim that the trend is due entirely to adjustment is justified. It isn't much of a test if you strike their adjustments and then introduce a big new one. I actually looked at ConUS with an early version of TempLS here. I looked at the period 1978-2009, and got a trend of 0.255°C/decade. This was using GHCN v2 min/max mean monthly data, with weighted regression using 5x5° cells. I thought I would update this calc, and for the period used by Roy. With TempLS V2.2, GHCN V3 V2 data and basically the same weighting, but with a period 1973-2011, I got a trend of 0.161 °C/decade. A bit less than CRUTem 3, but clearly there is trend in the unadjusted data too. Along the way, I discovered a trick question. 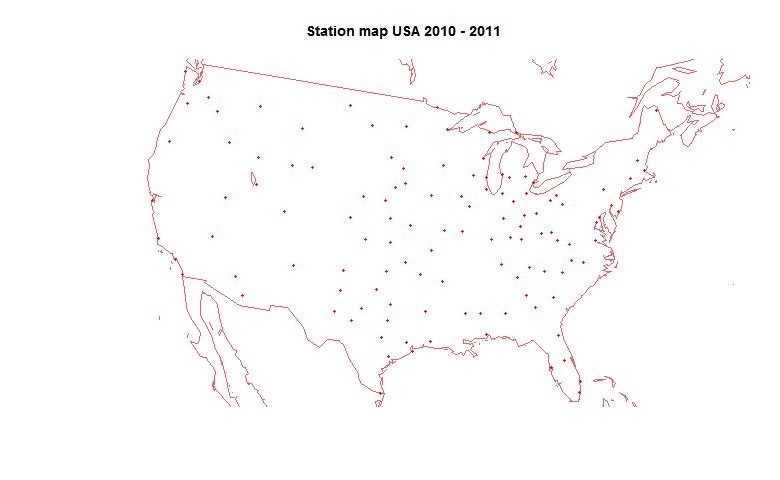 What is the easternmost US GHCN Met station? The answer is Shemya AFB in the Aleutians, Longitude 174° East. That did trick me - in TempLS you provide logical statements to specify subsets, and I thought for ConUS requiring country code 425 (US) and east of Long 125W would do it. So Shemya, and another station at Attu, got included. There weren't many readings, and I don't think they changed the trend by much.I've fixed it now. The distribution isn't that uneven. However, Ver 2.2 has some capabilities in mesh-based weighting. I was experimenting with those in Antarctica, and so I saw a chance to try them out here. The first thing I should say is that I haven't generally found that messing with weighting schemes changes average trends a lot. I should emphasise that the weighting scheme doesn't change the data, only the way it is included. Reweighting one station relative to another only has a big effect if they are very different. And of course, the changes tend to balance out in the average. The purpose of weighting is essentially to form a sum which is a good approximation to a space integral. 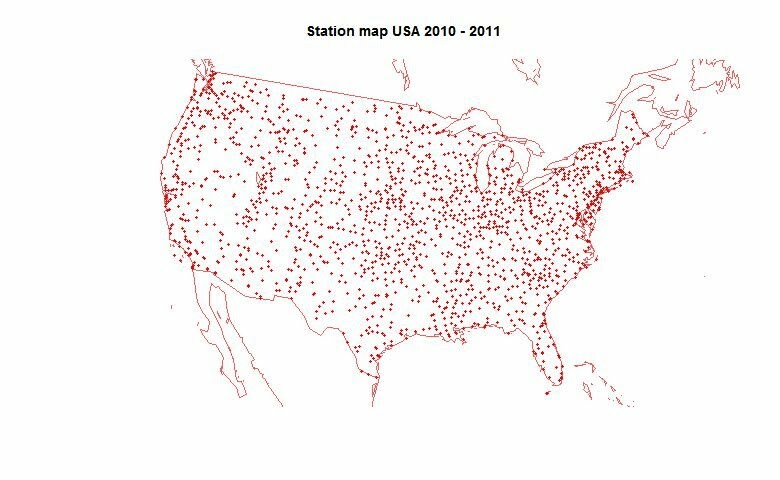 This has the appropriate physical significance, and also gives a rational basis for saying that bias due to clustering of stations has been overcome. The best way I have found to use meshes is to surround each node of the mesh (which is done for every month, so the nodes are the stations reporting in the month) by the area formed from the adjacent portions of the triangles marked out by the medians and the edge bisectors. The preferred method is Voronoi, which forms the in-centres and the perpendicular bisectors. But here we're only trying to associate with each node an area for weighting purposes, so it isn't critical to have the areas exactly demarcated by closest neighborhood, as long as they are close and unique. And this scheme is a lot faster, which is important when you need a new tesselation every month over 40 years. I generate the meshes using R's convhull function. I use the 3D version, which means that I find the hull of the curved area (US). There is a back mesh, which is fairly easy to get rid of because the normals face the other way. But for a country shape, it incorporates bays etc with the land area. For Antarctica I had trouble with the Weddell Sea and used a scheme for carving part of it out. This time I tried a new scheme which gets rid of the back mesh as well. I introduce a ring of new points (before meshing) which form a ring outside the stations. The idea is that if you ran a string around the surrounding nodes, it would be clear of any real stations. Then after having meshed the larger area, I eliminate the extra nodes and any triangles entailed. That tends to strip down to the real country outline. It's worth reminding that TempLS doesn't actually know about borders - it only has the location of the selected stations. So here is the result. 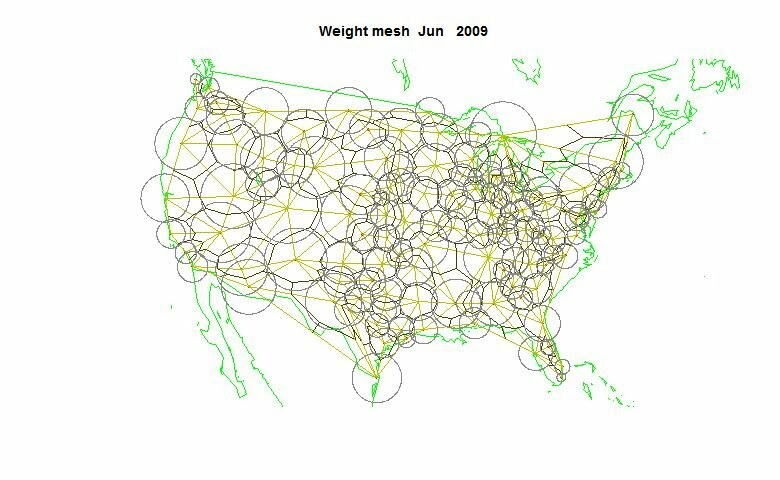 I'm showing the mesh in the background and weights proportional to the area of the circles around each station reporting in a particular month. You can see that stations in sparser areas are upweighted according to the area they are taken to represent. With the most recent mesh as shown in the diagram, I found that the trend using unadjusted GHCN monthly data for ConUS stations was 0.167°C/decade from 1973 to 2011. This is very similar to the cell-weighted figure (0.161), somewhat less than CRUTEM 3 (0.198) and less again than USHCN (0.245). Notwithstanding, I believe that the USHCN adjustments are justified, and theirs is the preferred figure. But is certainly isn't true that the adjustments are responsible for the uptrend. At WUWT Geoff Sherrington made the predictable objection that GHCN unadjusted data has been tampered with by the met stations. I've seen this often, but never with evidence. In fact the original GHCN (mid 90's) was compiled direct from the records, to the extent that they preserved the various fragments from different sources. They then distributed that on CD, to many recipients. In more recent times, I have never seen any indication that GHCN unadjusted records have been adjusted. There are occasional records removed when errors are found. Others come in late and are included. But they say that they don't modify records except on receipt of an amended CLIMat form from the Met supplier, and that seems to be true. Since the mid 90's these forms have been used exclusively, and you can inspect them here. The TempLS analysis, based on GHCNV3 land temperatures and the ERSST sea temps, showed a monthly average of 0.29°C, up from 0.19 °C in February. This is in line with satellite LT trends, though a more modest rise. There are more details at the latest temperature data page.